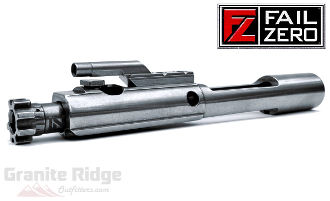 A completely assembled, ready to install 6.5 Grendel EXO NiB Bolt Carrier Group from FailZero. This 6.5 Grendel Bolt Carrier Group (BCG) comes fully assembled and ready to drop into most Mil-Spec upper receivers chambered in 6.5 Grendel (Type 2). All critical parts are coated with EXO Nickel Boron technology that provides permanent dry lubricity, extreme durability and increases both wear and corrosion resistance. EXO Nickel Boron makes for easy cleanup and will improve the performance of your rifle.